Limp. Pop. Stagger. These are three things I really never wish for my dog to experience and in the past few weeks all three have come to fruition. No tail wag here. Despite all my ardent fervor, due diligence, trying my hardest to avoid surgery, and following the CM protocol, Dexter now has a full ACL tear and a possible damaged/torn meniscus. Bleachhhh. I was told by the place that fitted Dexter for his custom orthotic that he could pretty much resume activities of daily living. Dexter is not an overactive dog, but he likes to run and play, chase a ball, play wrestle, and socialize with people and pets on our daily walks. Something never quite set right inside me to let Dexter do some light running to chase a ball at a nearby park, but I allowed it. After all, the brace was stabilizing his knee and promoting scar tissue formation at the spot of ligament tear. What is more likely is the brace did help to stabilize the knee but his running with it on did more to put stress on the already fragile ACL and snap, one day it just gave out. Along with the pop sound I am hearing now and again during leg movement, Dexter’s veterinarian feels there is also meniscus damage as well. There was definitely not a strict period of “rest,” so now we escalate to the next level of treatment: surgery. There are many different types of surgical procedures for an ACL tear. A rip is simply not a rip, and a procedure to repair it runs the gamut: Depending on the size, age, condition, and so on, of the dog. We can pick from a variety of surgeries: Fishing line basically is sutured into place where the ligament is torn, the healing occurs, the scar tissue forms, the suture pops, and wha-la: New doggie (so to speak). Other surgeries include one called the TPLO, which I am hearing a lot about, but this involves breaking the bone, putting in a plate, and then doing some really technical stuff to the whole area so it heals up nicely. This tends to be performed on larger breeds of dog, with their bigger bones and all. My stout-legged Cocker Spaniel seems to be more of a candidate for extracapsular repair with the fishing line. Unfortunately, Dexter’s veterinarian does not perform orthopedic surgery of such a detailed procedure, so I get the lovely task of finding a surgeon I like, trust as much as possible, and who will do the procedure skillfully and with a sense of compassion to both me and my dog. “Don’t be a jerk-itis,” as I like to call it. 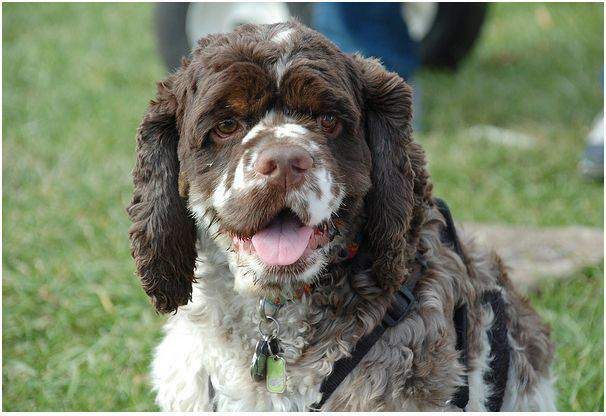 My last Cocker Spaniel went through orthopedic surgery at the Cornell University Hospital for Small Animals due to a knee cap that slipped its location: a patellar luxation. I slept on the floor with her for months and she recovered perfectly. This is a different injury and times have changed. It took me a few days to write this blog post because my insides felt like they were going to explode. I just hate the fact that my little man is injured and all my efforts to make him better without anesthesia, surgery, and the icky postoperative recovery and rehab time could not be avoided. If this guy ends up not being the right fit, we will start over: Our vet has recommended a center in Maryland that apparently does orthopedic surgeries on government dogs, so one would believe they don’t mess up. I’m putting the cart before the horse though, and I need to see if the vet a mile or so from our home works out. And despite my many attempts to change his mind, our vet cannot do the surgery. Crap. I would not change a single thing about the course of conservative management we have been on since earlier this year. I would be stricter about it, calling my vet to ask if allowing Dex to run in his brace was indicated (it was not), and I’d continue with more laser therapy sessions. But that’s all water under the bridge now. My concern is the other leg developing a tear of the ACL. According to ScienceDaily.com, over 1 million ligament repairs are done in dogs every year, at a cost of over $1 billion dollars to U.S. dog owners. ACL surgery is not cheap, and even with my pet health insurance policy, there will be a cost. I’d sell my organs to help my dog, but it’s nice to have the cushion of pet insurance. Recovery isn’t a cake walk either, but nothing as invasive as knee surgery ever is, as anyone of the human variety who has had knee surgery can attest. Meantime, my little man knows he is no longer able to fetch a ball and that trying to run fast results in an “oops, can’t do it” reminder from his damaged leg. Da boo boo leg, as I call it. I know now more about the anatomy of a dog’s knee than I ever could have imagined I would. 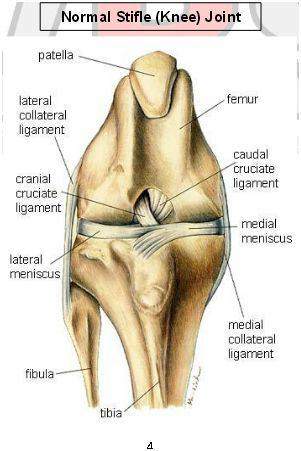 ACL means anterior cruciate ligament, but more correctly it is the CCL – cranial cruciate ligament. The knee joint is where the CCL resides. Another name for the knee joint is the stifle joint. So the stifle joint is composed of three major bones: the femur, the tibia, and the patella. At the end of these bones is cartilage and this allows bones to move around. The joint fluid is surrounded by a joint capsule. The CCL and one other ligament form a cross shape. With any movement, something needs to absorb shock. The shock absorbers of the dog’s knee are called meniscus. The femur sits atop the meniscus, so if your vet takes an x-ray of your dog’s knee, you will see what appears to be a space between the tibia and the femur. This is not a space at all, but the meniscus. Dexter’s is believed to be damaged. You also cannot see ligaments on x-ray. The diagnosis of a torn ACL comes with orthopedic manipulation by the veterinarian. So how does the ligament get damaged? Have you ever had a door break its hinge so that the door doesn’t open very well, if at all? This happens with a dog’s stifle joint when the CCL is compromised. The bones no longer properly align and the joint isn’t working as it should. Slice the ligament and there will be pain, inflammation and cartilage damage. Not good. The bones are basically rubbing when they do not need to be doing that. This is called cranial tibial subluxation. Ouch. According to the folks at CanineKneeSurgery.com, humans stand straight up, with their femur directly on top of their tibia, having a joint angle of 180 degrees. Dogs stand with an angle of 135 degrees. You can see in the diagram below from Canine Knee Surgery that the bone alignment depends on the CCL being intact to hold them in place. Chronic wear and tear on the CCL means it will eventually fail, and in my opinion, at an even greater risk to a knee injury. Angled bones with jumpy dogs have an increased likelihood of having issues. That’s where my life is right now: Limp. Pop. Stagger. Stay tuned for more updates as we progress through the ordeal. My hope in writing this series is to help dog parents being more informed and better educated when dealing with an injury of this nature in their own dog. Note: I am not a veterinarian and the experiences above are that of my own and not indicative of what I recommend or indicate to others. Always seek veterinary advice for any injury or issue with your own dog. Aww, this has given me Sunday morning sads. Poor Dexter. I hear you on finding a surgeon you ‘trust’… over the years it’s become clear to me that compassion is a quality that some veterinary surgeons lack. Wishing a speedy recovery! I’m so very sorry, Carol, to hear that your conservative approach to Dex’s injury hasn’t been as successful as you wanted it to be. 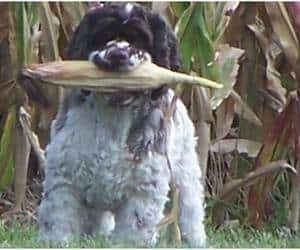 As you know, my cocker spaniel DeeDee tore her ACL right after Dex injured his. So far, our conservative approach with cold laser therapy twice a week along with homeopathic medications has helped her a lot. But, I’m sill waiting for the other shoe to drop when she unexpectedly jumps or runs and will cause us to go through the same surgery you’re discussing. I pray to God that it doesn’t happen. I know that surgery isn’t the end of the World, but will do everything in my power to avoid it. I will continue to pray for you and Dex as you travel this road and hope for the best. Ty so much, Juanita. I have been wondering how DeeDee is doing. It’s those unexpected twists, turns, jumps, etc that scare the tar outta me. I want him to have his life back, sans the high jumps, and not tear the other ACL in the right leg. I appreciate you writing and give DeeDee a gentle tummy rub from me, okay? I pray she continues healing up. Sounds like you’ve got a good plan in place there. You did everything that you could do to try and avoid surgery and you have to feel good about that. You are right. times HAVE changed and maybe it won’t be as bad as you think. I am so sorry that you and Dex have to go through all of this. I am certain he will be a good patient and he couldn’t have anyone to give him better love and care than you. Will send prayers that you find the doctor that is THE ONE and that he can make your boy all better! I appreciate it very much, Caren. It is the defeatist feeling I have to get over. I now want to avoid the same issue in the other leg, which is common when one tears. Many hugs and thanks. Yeah, I have been feeling pretty defeated. I appreciate the kind words. Good to hear Casey’s ACL surgery went well – apparently this is an oh-so-common injury. Paws crossed he doesn’t tear the other one. Thanks for writing, Dolly. Oh, poor Dexter! I hope it’s not painful for him. And hopefully you can find a good surgeon for him soon. Thanks, Dawn. That’s the point I am at now: Find a good surgeon and get it done. I’ve ordered the dog jogger stroller and placing an order for a non-plastic cone today – he’d freak out. So sorry to hear about this! Mom says she aches herself when one of us is sick or injured and it tears her apart but so far we have not had to deal with such a serious injury. When mini humans are injured the parents always wish they could trade places with the child, Mom says it is the same with her and us dogs. Maybe because we don’t have mini humans or maybe because she want the world for her furry girls? We hope you find a great surgeon so you can get the surgery behind you and start the healing process. On the positive side, with a couple bloggers having similar experiences you can help each other out and lean on each other when things are rough because you all know what is going on. Get well wishes to Dexter! Thanks a lot, Emma! That’s exactly how I feel: I want to take the place of Dex and take the injury on myself. I look down at my office chair and see that Dex has formed a crop circle of balls around my feet. He thinks I forgot to play with him – and that tears me apart! I know it’s best he not run, and now I think I am the one who will end up needing a cone. 😉 In any case, thanks so much and I will def. keep you posted. Woofs and wags. We’re SO sorry the conservative route hasn’t worked for Dexter. Vlad & the whole family know how hard that conservative method is when an active puppy wants to do everything on earth EXCEPT live life in the slow lane. He developed a “possible” OCD in his right-shoulder-joint when he was 5 mths old–hasn’t been off-leash since and won’t be until he’s 2 yrs old. Your disappointment that CM didn’t work can be felt throughout this whole post. Hopefully your surgeon-visit goes well, and the surgeon isn’t someone that you feel doesn’t have Dexter’s best interests at heart, or sounds like someone that’s incompetent. We imagine the surgery will be hard enough on all of you without having to travel a long distance to get it done and have follow-up care. We’ll keep Dexter in our prayers along with our fingers crossed that everything goes wonderfully for him. Yeah I’ve been feeling pretty Debbie Downer, but now must pick myself up and be strong for Dex. TY so much. Alright my friend, I learned a lot from this post! You just amaze me. Sherman keeps making attempts to sucker me into throwing his toy. He’ll bring it to me a few times a day and drop it at my feet and then give me those puppy dog eyes! I try to offer him belly rubs instead of throwing the toy and it works, sometimes. I keep telling him, one day we will be able to play catch again! Hey Jen, I also ordered this onesie thing with a potty break area for Dex and they come in Sherman size! If he still can access the area, I will invest in a BiteNotCollar or a small piece of fabric Velcro to keep him from the affected leg. The photos and reviews look very promising. I ordered the long sleeve one and it is slated to arrive in 2 to 3 days. I am also flattered b/c I learned so much from you and continue to do so. I will have every paw crossed for Sherman on Wednesday and a big hug and prayer for you and the guiding hands of those in the O/R. Thanks again. Oh, I’m so sorry to read this. What a drag that the conservative management approach didn’t work – but you gave it your best shot. Sending pawsitive thoughts that you’ll find a great surgeon that you can trust. I’ve never had to deal with this injury with a dog before (although the hubs’ knee – that’s a different story…) so have no advice but know we are sending good thoughts your way! Poor Dex and poor you! I’ll be sending good thoughts your way. Sorry to hear you have to go through this surgery. Best wishes for a swift and complete recovery. CAROL AND POOR BUT VERY BLESSED DEXTER, MY HEART GOES OUT TO YOU THROUGH ALL OF THIS. THESE ARE OUR KIDS AND WE GO THROUGH EVERYTHING WITH THEM. A LOT OF SLEEPLESS NIGHTS AND DAYS OF ANXIETY. DEXTER IS A REALLY GOOD LOOKING MAN AND A LOT OF PRSONALITY. HE KNOWS HOW MUCH YOU LOVE HIM. I NOW YOU WILL FIND THE MOST QULIFIED VET TO DO THIS SURGERY. HOPEFULY HE IS RIGHT THERE ON YOUR VISIT TODAY. MY HEART FELT PRAYERS ARE WITH YOU AND I WILL KEEP AN EYE ON YOUR MOST INFORMATVE AND KNOWLEDGABLE STORY. MANY HUGS, KISSES AND PRAYERS TO YOU BOTH. JOAN FOUND THIS WEBSITE IN MY NEW “DOG FANCY” MAGAZINE. GLAD I DID. Thanks SO much, Joan, and welcome to the Fidose of Reality pack. I really appreciate the kind words, and I am very glad you found us in Dog Fancy – one of my favorite magazines and near and dear to my heart.